The Pentagon has posted to its website the roughly 8,000 pages and audio tapes it was forced to provide to the New York Times regarding its "military analyst" program. Anyone who reads through them, as I've now done, can only be left with one conclusion (other than being extremely impressed with David Barstow's work in putting together this story): if this wasn't an example of an illegal, systematic "domestic propaganda campaign" by the Pentagon, then nothing is. While bloggers have kept the story simmering, Democratic congressional leaders also are speaking out, calling for investigations that could provoke the networks to finally cover the Times story — and, in effect, themselves. Beyond the networks' keeping this scandal completely concealed from their viewers, The Politico story noted that only two network executives -- CNN's President Jim Walton and ABC's President David Westin (.pdf) -- even bothered to respond to the letters sent by Rep. Rosa DeLauro to all networks demanding answers with regard to their complicity in this program. When responding, the two executives -- exactly as Brian Williams was when he was finally forced by blog-inspired commenters to respond (on his blog, but not on NBC) -- were casually dismissive of the entire matter, insisting that they had done nothing wrong (other than CNN's acknowledgment that they failed to detect a conflict of interest with regard to a single military analyst they had used). Let's just lay out some of the relevant facts about what happened -- looking at one episode illustrating how this entire program worked and what CNN specifically did. Then, we can see whether CNN served as an eager instrument for a corrupt domestic propaganda campaign by the Pentagon, or whether, as Walton claims, CNN acted with perfect propriety. Tomorrow, we'll do the same with regard to ABC. In June of 2005, communications officials in the Pentagon began planning a military-sponsored trip to Guantanamo for selected retired military officers who were currently working as "news analysts" for various television networks and magazines. Amnesty International had just issued its most scathing report yet about Gitmo, as part of its 2005 report on America's "new gulag of prisons around the world beyond the reach of the law and decency." It specifically called Gitmo "the gulag of our times," and detailed years of extreme abuses that had taken place there. To counter Amnesty's findings, the Pentagon planned the Gitmo trip over the course of two weeks in mid-June. They eventually confirmed June 24 as the date for the tour, with a list of ten participants, including retired Gen. Don Shepperd of CNN, along with various "military analysts" from MSNBC and Fox. From the beginning, the whole trip was transparently propagandistic, and there was no possibility that the participants could learn anything meaningful about Gitmo. It was a one-day itinerary (pp. 7476-7477). They left Andrews Air Force Base at 6:45 a.m. on June 24, and did not land in Cuba until 10:00 a.m. Virtually the entire 3 hour plane ride was filled with "briefings" by various DoD officials, and after they landed -- and before they were taken to the detention camps -- they were given another 90 minutes of briefings. They did not even arrive at Camp Delta -- where the detainees are kept -- until 12:35 p.m. that afternoon. After a 50-minute lunch with the troops, they began a guided tour of Camp Delta at 1:20 p.m. which lasted a grand total of one hour and 25 minutes. Packed into that 85-minute tour was a viewing of an interrogation, a tour of an "unoccupied cellblock," and a visit to the detention hospital. That was all the time they spent touring Camp Delta: 85 minutes. Then, at 2:45 p.m., they were brought to Camp V for 10 minutes, followed by a tour of Camp X-Ray for 35 minutes. Then they left Cuba -- to fly home, with the "wheels up" on their plane at exactly 4:30 p.m. the same day, arriving back at Andrews that night at 7:45 p.m. They were then brought back to the Pentagon at 8:00 p.m. They spent a grand total of 3 hours and 55 minutes at the Guantanamo detention facilities, with almost one hour of that devoted to lunch with the troops. That was the sum total of their grand tour of the detention facility: less than 3 hours. And then the propaganda campaign to malign and dispute the extensive, amply documented findings of Amnesty was unleashed in full. "Did we drink the 'Government Kool-Aid?' -- of course, and that was the purpose of the trip." In his Pentagon report, Shepperd added the obvious: that "a one day visit does not an expert make," that "the government was obviously going to put its best foot forward to get out its message," and that "former military visitors are more likely to agree with government views than a more appropriately skeptical press." He is hosting a number of radio shows this summer. I would have to think he would have every member of Congress on to talk about their trip together -- a definite plus for us looking to expand the echo chamber. Demonstrating how controlled by the Pentagon were these "analysts," Shepperd's email to "help" was forwarded to top Rumsfeld aide Larry Di Rita, who replied (7470): "OK, but let's get him briefed on Khatani so he doesn't go too far on that one" -- referring to the so-called 20th hijacker Mohammed al-Khatani, whose Guantanamo interrogation had been particularly brutal, as he "was stripped naked, isolated, given intravenous fluids and forced to urinate on himself, and exercised to exhaustion during interrogations that lasted 18 to 20 hours a day for 48 of 54 days." "Helping" the Pentagon is exactly what Shepperd, pretending to be an "independent analyst" on CNN, then proceeded to do. In numerous appearances on CNN talking about Gitmo, no mention was ever made of Khatani or other specific, documented abuses. 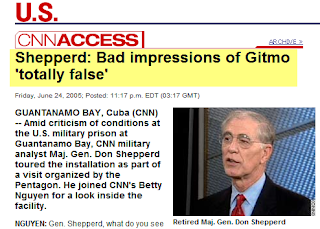 To the contrary, Shepperd's "analysis" -- broadcast all over CNN -- was exactly what it would have been had Rumsfeld himself written the script. NGUYEN: We have just established a line to Guantanamo Bay, to our military analyst General Don Shepperd. He arrived there as part of a trip put together by the Pentagon in wake of that human rights report that criticized conditions at the U.S. prison for war detainees. General Shepperd on the phone with us right now. General Shepperd, what do you see so far while being there? MAJ. GEN. DONALD SHEPPERD, CNN MILITARY ANALYST: Well, . . . I tell you, every American should have a chance to see what our group saw today. The impressions that you're getting from the media and from the various pronouncements being made by people who have not been here, in my opinion, are totally false. What we're seeing is a modern prison system of dedicated people, interrogators and analysts that know what they are doing. And people being very, very well-treated. We've had a chance to tour the facility, to talk to the guards, to talk to the interrogators and analysts. We've had a chance to eat what the prisoners eat. We've seen people being interrogated. And it's nothing like the impression that we're getting from the media. People need to see this, Betty. . . . I have been in prisons and I have been in jails in the United States, and this is by far the most professionally-run and dedicated force I've ever seen in any correctional institution anywhere. NGUYEN: Let's back up for just a moment, because you said you said watched an interrogation. NGUYEN: Kind of explain to us how that played out. And were there any instances of abuse or possible abuse? SHEPPERD: Absolutely not. These -- when I sat and watched them, I want to be very careful in describing them. And I don't want to describe how we watched or anything of that sort. But basically, you're able to observe interrogations. They have various ways of monitoring the interrogations and what have you and letting you see what's going on. With the interrogations that we watched were interrogators, there were translators that translated for the detainee and there were also intelligence people in there. NGUYEN: Laughing in an interrogation? SHEPPERD: ... in the two of them that we watched. Yes, indeed. It's not -- it's not like the impression that you and I have of what goes on in an interrogation, where you bend people's arms and mistreat people. They're trying to establish a firm professional relationship where they have respect for each other and can talk to each other. And yes, there were laughing and humor going on in a couple of these things. And I'm talking about a remark made where someone will smirk or laugh or chuckle. NGUYEN: All right. General Don Shepperd, we appreciate your time and that look inside Gitmo, with you being there on this tour. Thank you for that. What we saw in Guantanamo bears no resemblance to what we are reading in the print press out there. Most of the people writing about this, I believe, have never been there. What I saw is we have -- we have impressions of an old facility, Camp X-ray, that was closed three years ago. What we have now is a modern, well-constructed prison, guarded by very, very dedicated people, doing an extremely tough job in the midst of very, very dangerous people, Soledad. Shepperd then went on to claim that interrogators are still getting "valuable information" even from detainees held there for years. In fact, "we have really gotten a lot of information to prevent attacks in this country and in other countries with the information they're getting from these people. And it's still valuable." Shepperd managed to reach all of these findings -- and to label Amnesty's findings "totally false" -- by virtue of a single, three-hour guided tour. Shepperd is the President of The Shepperd Group, which "provides expert guidance and consulting services to defense contractors." CNN's viewers were never told about that. ["I did a Fox & Friends hit at 0620 this morning. Good emphasis on 1) no torture, 2) detainees abuse guards, and 3) continuing source of vital intel"]. Conversely, those whose media commentary displeased the Pentagon had their access cut off. In May, 2006, Greg Kittfield wrote a cover story for National Journal featuring criticism by numerous retired generals of Rumsfeld's war management. In response, Pentagon official Bryan Whitman circulated an email which read: "Given this cover story by Kittfield, I don't think we need to find any time for Kittfield on the Secretary's calender." This Gitmo trip and the ensuing "analysis" was but one small -- though highly representative -- episode that was part of the Pentagon's five-year propaganda program aimed at shaping domestic opinion on the Iraq war, the "War on Terrorism" generally, and virtually every controversy relating in any way to the Pentagon. It is difficult to see how this could be anything but illegal [for an analysis of laws prohibiting covert domestic propaganda activities, see here, here, here, and here< (.pdf)]. But what is most extraordinary about all of this is that huge numbers of Americas who were subjected to this propaganda by their own Government still don't know that they were, because the television networks which broadcast it to them refuse to tell them about it, opting instead to suppress the story and stonewall any efforts to find out what happened. As corrupt as the Pentagon was here, our nation's major media outlets were at least just as bad. Their collective Pravda-like suppression now of the entire story -- behavior so blatantly corrupt that even the likes of Howie Kurtz and The Politico are strongly condemning them -- has become the most significant and revealing aspect of the entire scandal.